Alright, we've got Rosie's floors done, her exterior painted, the cushions are upholstered, the interior is painted, the counters have gotten their concrete overlay andddd by the time we got to the cabinets we were feeling very ... how do the French say it ... broke. The idea of spending several hundreds of dollars (the horror) on custom cabinets sounded like a dumb thing. And we absolutely were not making them ourselves because we legitimately didn't have time (or skill) for that. Got it? This is basically the Semi-Homemade of camper renovations and we know you're here for it. Please still love us, friends. We assessed the state of the existing cabinets and decided that on a scale of 1 to hideous, they were a solid 6. In definite need of a makeover, but still structurally salvageable. We needed to sand them down a bit to fix all of the busted up edges, lightly sand the surface to prep for painting, and then go shopping for cabinet hardware. Side note: if you're interested in learning about the tools needed for a camper renovation, check out our checklist for camper demo tools! Shopping for cabinet hardware was remarkably fun, which is something I never really thought I'd say. Does this mean we've reached peak Nate Berkus? Are we going to start wearing turtlenecks? Do we need to have children? 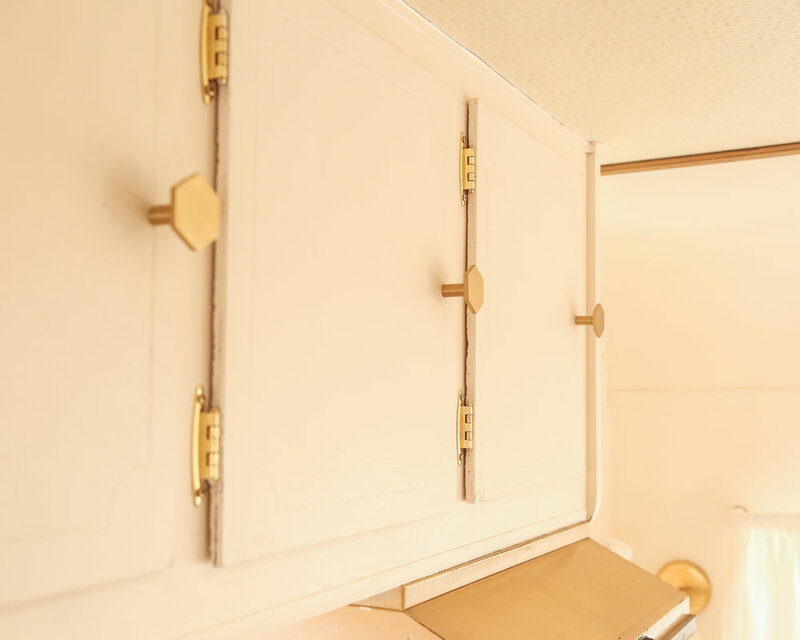 There are just so many options to make your cabinets stand out, and because we'd planned to paint the cabinets the same color as the walls we knew the hardware really needed to be the focal point. We'd already decided on hexagon tiles for the kitchen back-splash (which hasn't yet been grouted, so ignore that part of the photos) so we thought hexagon hardware would be a really cute tie in. Other things we almost went with instead: vintage brass mix matched pieces, anything made by Anthropologie, ceramic knobs, and even burning the entire thing down (kidding). We actually went through a whole lot of options extremely quickly, but here's a whole selection for you to browse. 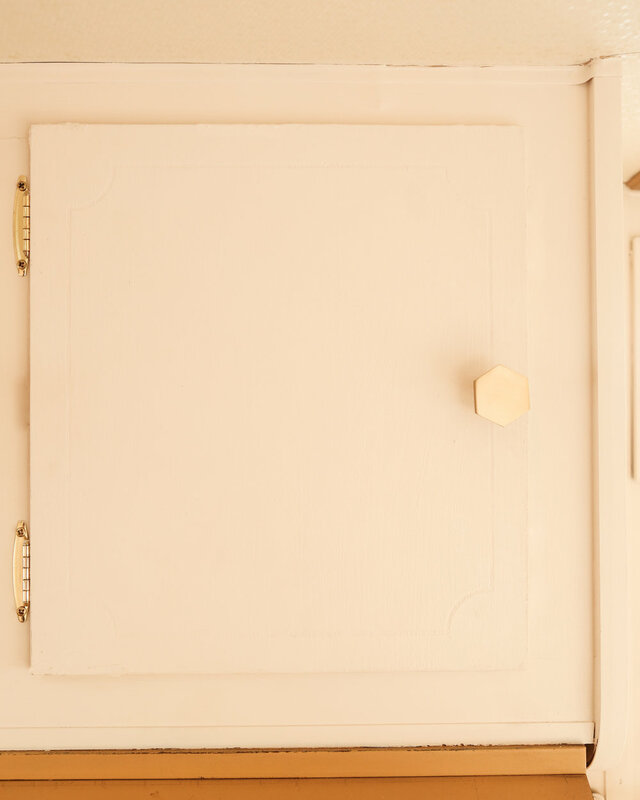 I'd say these 1.5" wide knobs are probably the largest cabinetry hardware you should put on any moderate to small-sized cabinets, but we wanted to add a little flair (or what the 90's referred to as "bling") and they sure as heck do. We also used a simple brass cabinet hinge that more or less matches the pulls. Also, because we are working in a trailer and everything needs to be secure for the road, we got some cabinet catches and installed them on the back of the cabinet door and the inside shelves. As part of our partnership with eBay for Rosie's Renovation, we're showing you how you can use the site for pretty much every step of a vintage camper renovation. Check out their full selection of cabinets and cabinet hardware if you're tackling your own cabinet refresh! Here's a little visual and step-by-step action for ya! This process is really not a cute one. The cabinets were fraying around the edges and many of them had random stains and dents and to be honest I wasn't actually sure these would work until we put them in and they didn't look like total crap. But, here we go. Step 1 is to just remove all of the existing hardware. You might just want to go ahead and toss it, or if you're feeling ambitious you can polish, paint it, what have you. We bought new hardware, so no need to keep the old stuff. Step 2 is to sand down all of the cabinets really well first with a 60 grit sandpaper (and a hand sander) and then a 400 grit sandpaper. The 60 grit will remove all of the really messed up stuff and give you a relatively even surface, while the 400 grit will follow behind and polish down the scratches left from the much rougher 60 grit. Wipe it all down really well. 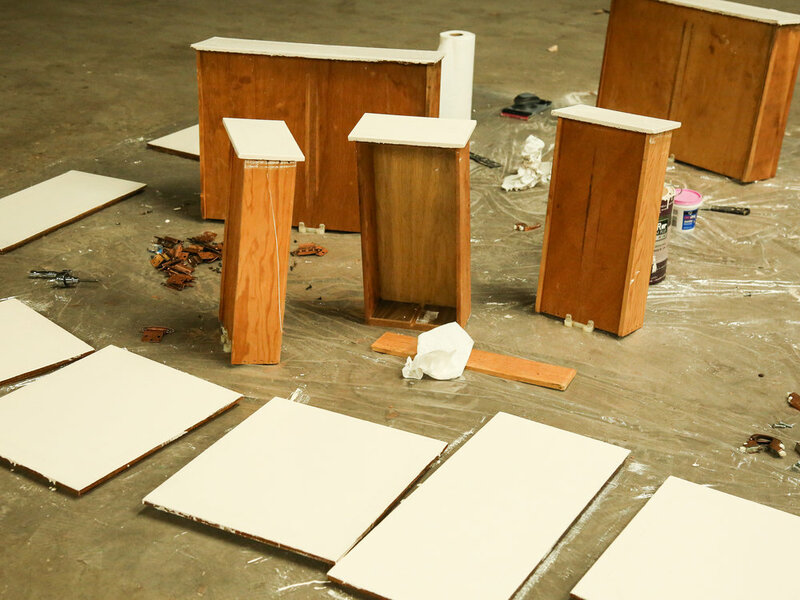 If you're not working with super super old cabinets like we were, you may really not need to spend a ton of time sanding, instead just scuff the surface of each piece up a bit with the sand paper to give the paint something to adhere to. Fill any holes or deep marks with spackle - which my autocorrect is trying to turn into "sparkle" because my computer understands my soul - and smooth it out with a plastic putty knife. Let it dry and then sand down again going from 60 grit to 400 grit. Clean off all the sanding dust and we're ready to get to painting! Step 3 is to lay out a whole lot of painters plastic and get your first coat of paint on. 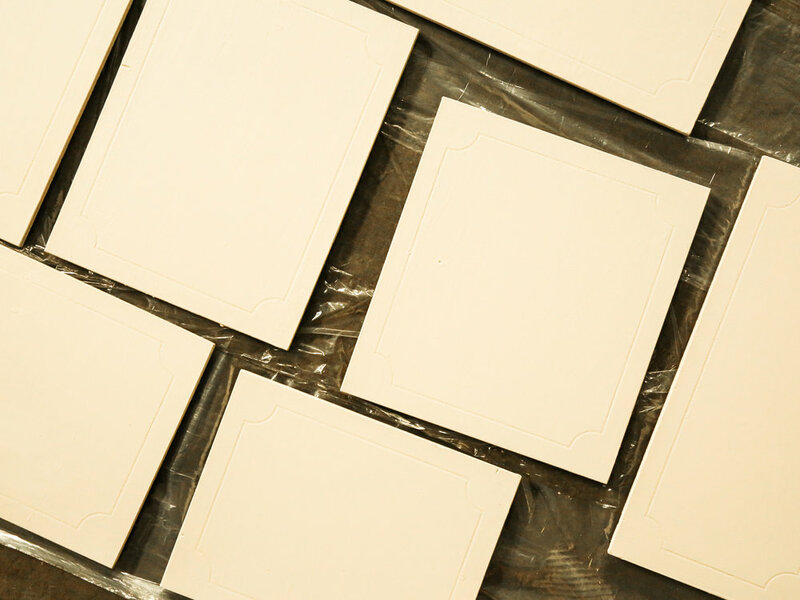 If you're working on the fly like we are, use one sheet of painters plastic to lay your cabinets on for sanding, and then roll out a new sheet to place the freshly sanded and cleaned cabinets for painting. This way you won't be painting them on a surface covered in old sanding dust and gunk, which will easily work it's way into your paint job. We matched our cabinet doors to Rosie's interior walls, in the color Choice Cream by Sherwin Williams. Not my favorite paint color name, but damn I'm obsessed with the warm off-white sultriness and the slightest hints of blush undertones. Do normal people describe paint this way? Anyhow, you're going to do the first coat and by the time you're done the last cabinet (assuming you're doing more than like four cabinets) the paint on the first one should be dry and you can circle back around and use your 400 grit sandpaper again on anything that needs another sanding down. Then, go ahead and do your second coat. Let dry, and hit it again with that 400 grit to reallllly smooth it all down. Clean it all of with a rag and prepare your hardware! Once they're all painted, it's time for step 4: the hardware install. This process is going to vary depending on your own flavor of cabinet, but ours needed just two simples hinges and of course the cabinet pull. We made it a point to leave a little bit of an indentation where the original hardware was, so it was extremely easy to match and drill. Boom, done. When it came to putting them on the walls, we did the same thing, leaving the original markings from the hinges so we knew where they would go. Overall this project cost us roughly $100 and took four hours. If we'd made new ones ourselves, we'd estimated it would've cost us $250 and taken one or two days. If we'd gotten them custom made it would've taken us no real time but likely cost between $400 and $600 at the very least. So, saving a day or two of work and up to $500? Yes mama we will take it. Let us know what you think! Check out the full series on Rosie's Renovation, where we're turning this 1969 vintage Globestar camper trailer into our teeny tiny dream home. On wheels.